4Easysoft M2TS Converter has been designed to convert M2TS files, manage and enhance your M2TS files. This M2TS files Converter can convert M2TS to MKV, AVI, WMV, MP4, FLV, SWF, HD videos and more with fastest and most efficient way. The multiple media options in M2TS Video Converter enables you convert other videos, like MTS, TS, MOD, TOD, MOV, FLV, WMV, HD MP4, etc to what you need format. 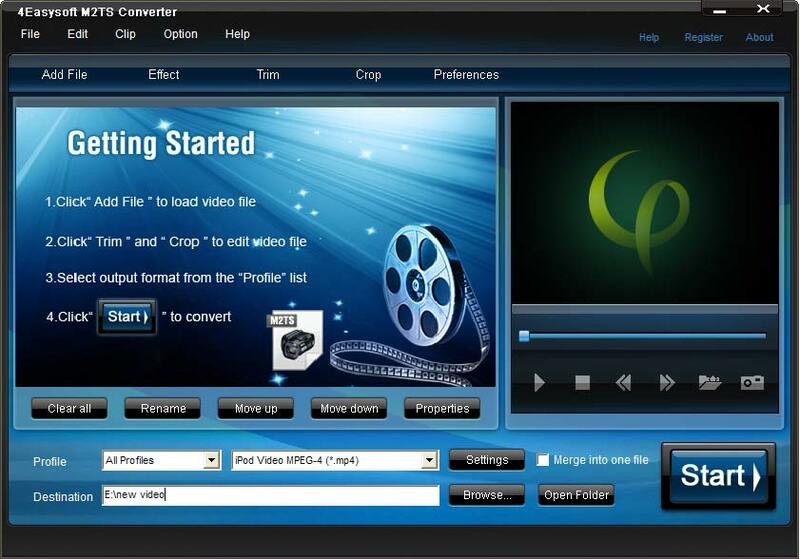 The added audio converter and audio extractor helps you to create your own music from videos and audios. 4Easysoft M2TS Converter can perfect your video with professional effects, including video cropping, movie effecting, movie trimming, watermark inserting and video joining. It also can help you optimize your video by adjusting video Brightness, Contrast, Saturation, Deinterlacing and more. 4Easysoft M2TS Converter supports to convert M2TS files to different formats at one time to meet your need. The M2TS files converted by 4Easysoft M2TS Converter will be output for distribution on the web, put on iPod, iPhone, Apple TV, PSP, PS3, Xbox 360, Zune, Archos, Sandisk, iRiver, Creative Zen, MP4/MP3 Player, Smart Phone, Pocket PC, Mobile Phone, etc. 4Easysoft M2TS Converter allows you to set the video Brightness, Contrast, Saturation. Checking Deinterlacing helps you to convert interlaced video to the progressive video, this function can optimize the video effect. 4Easysoft M2TS Converter doubles your enjoyment with joining several interesting clips into one. Crop frame size to remove your unwanted area using M2TS Converter like the smart scissors. Make use of this special function to choose subtitle and audio track when you need. With professional video encoding and decoding technique, 4Easysoft M2TS Converter brings you the advanced and high speed converting process. On the other hand, this M2TS converter has the magic charm to impress users with best video quality. Convert 3GP/MP4/VOB/FLV, and others to H.264/AVC video.